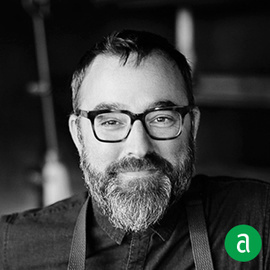 Josh Henderson, Chef and Founder of Huxley Wallace Collective in Seattle, shares his career timeline and advice for up-and-coming talent. My team needs my feedback more than anything. We need to be connected as much as possible, so I can try to connect as much as I can, even if it’s popping in for 5 min. I’ll jump on the line to help plate, or help run food if that’s where they need me the most. I want them to know that I am there to be their support and to help them be as awesome as they can be! My dad always said “people do what you inspect and not was you expect”. People want to be checked up on. I let my team discover and develop themselves, but am also very involved with their growth. I like to jump in and show them new techniques but also like for them to be self-motivated. Two things I cannot do my job without is my team and having a blast doing what we do! Certain skills that are key in this industry are hard work, that goes without saying. But also curiosity and the constant drive to learn something new every day. Always try to work with people you like and can learn from. When I was an undergrad in Music School, I knew I needed to make a switch. I had worked in restaurants since I was 14, so I decided to leave Music School and go to CIA Hyde Park. Music just felt more subjective than food, and I never had the opportunity to go to a big school until then. I knew this was my one chance for me to prove to myself that if I put my mind, passion and energy into culinary school, I’d succeed. The energy of working in a restaurant was also a real motivation for me, but it wasn’t until I completely immersed myself that I was truly inspired by food, every single day.